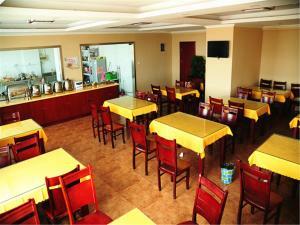 Providing free WiFi, GreenTree Inn JiangSu ZhenJiang JieFang Road JiangSu University Affiliated Hospital Express Hotel offers rooms in Zhenjiang, 5 km from Jinshan Temple. All rooms feature a TV with cable channels and a private bathroom. 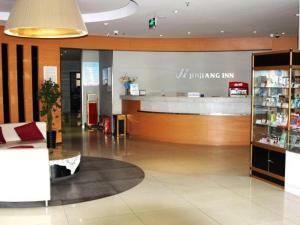 Jiangsu University is 8 km away and Hailanggu Water Park is 11 km from the hotel. The units in the hotel are equipped with a kettle. All rooms have a desk. Staff at reception can help around the clock with guidance on the area. Changzhou Benniu Airport is 57 km away. When would you like to stay at GreenTree Inn JiangSu ZhenJiang JieFang Road JiangSu University Affiliated Hospital Express Hotel ? This double room has a electric kettle, air conditioning and cable TV. This property reserves the right to release the room after 18:00 on the day of check-in. Guests who plan to arrive after this time should contact the property directly. The contact information can be found on the confirmation letter. This property reserves the right to release the room after 18:00 on the day of check-in. Guests who plan to arrive after this time should contact the property directly. The contact information can be found on the confirmation letter. Each day we'll check prices and send you an email for your selected dates at GreenTree Inn JiangSu ZhenJiang JieFang Road JiangSu University Affiliated Hospital Express Hotel. If you don't have specific dates but would like to check prices for say next weekend or say next month we can check the price too. Click to write a review and share your experience of GreenTree Inn JiangSu ZhenJiang JieFang Road JiangSu University Affiliated Hospital Express Hotel with other travellers.